1. 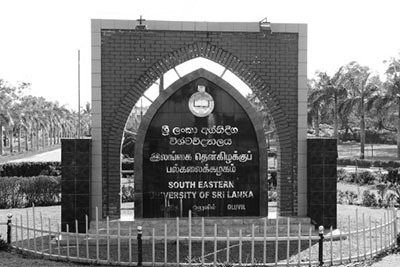 The Chairman, Department Procurement Committee (Major) of the South Eastern University of Sri Lanka invites sealed bids from eligible and qualified bidders for Supply Installation and Commissioning of Network Equipments for the use of South Eastern University of Sri Lanka. 3. Bidding will be conducted through National Competitive Bidding. 4. Interested eligible bidders may obtain further information from the Deputy Bursar (Telephone no: 067 22 55 178), South Eastern University of Sri Lanka, University Park, Oluvil # 32360 from 9.00 a.m. to 2.00 pm up to 10.07.2018. (Week days only). 5. A completed set of bidding documents in English Language may be purchased by interested bidders on the submission of a written application by Bidder himself or by bidders' representatives to the address above and upon payment of non refundable fee of LKR 5,000/= per procurement document, from 9.00 am to 3.00 pm up to 09.07.2018. The mode of payment shall be either in cash or bank draft in favor of "Bursar, South Eastern University of Sri Lanka". The Bidders can also down load the Bidding documents from the University Website i.e. www.seu.ac.lk. Those who are obtaining bidding documents from the University Website should submit the completed documents along with a Bank Draft drawn in favour of the "Bursar, South Eastern University of Sri Lanka" for Rs. 5000/- as non-refundable fee or to the shroff The documents may be purchased up to 09.07.2018. 6. Sealed Bids should be marked "Tender for Supply Installation and Commissioning of Network Equipments (CISCO) for South Eastern University of Sri Lanka" on the left hand corner of the envelope and delivered to the Chairman, Department Procurement Committee (Major), South Eastern University of Sri Lanka, University Park, Oluvil # 32360 or place in the tender box kept in the office of the Supplice Division, South Eastern University of Sri Lanka, on or before 2.00 p.m., 10.07.2018. All bids must be accompanied by bid security as stated in paragraph 01 above. Bids will be opened in the presence of the bidders' representatives who choose to attend in person at 2.30 p.m. on 10.07.2018. at The Board Room - 2, Ground Floor, Administrative Building, South Eastern University of Sri Lanka, University Park, Oluvil # 32360. Late bids will be rejected.